More than 100 people turned out for a community meeting on Tasers Tuesday night, first breaking into small groups of roughly 25 each, and then convening in a fiery public comment session that at one point erupted into activists chanting, “No Tasers!” and drowning out Police Commissioner Sonia E. Melara’s calls for order. The police commission has voted against the use of Tasers three times in recent years — in 2004 and twice in 2010 – and has taken up the issue again because a 2016 Department of Justice report on the San Francisco Police Department recommended that the city “strongly consider deploying” Tasers. At Tuesday’s meeting, Police Chief Bill Scott made clear he believes Tasers are a necessary addition to the department’s existing set of non-lethal-force options, while a majority of the public in attendance cried foul on adding them to an officer’s arsenal. “Until SFPD shows that you’re prioritizing the way you’re going to transform from a warrior to a guardian culture,” Tasers should be opposed, said Adriana Camarena, a Mission District activist and an advocate for the families of police shootings, including Luis Gongora Pat, a man who police shot and killed in the Mission in April 2016. “Then, down the line, we can talk about Tasers,” she added, provoking cheers and applause from the crowd. While the public spoke, first in the small groups and later in the large session, Police Chief Scott and two of the seven commissioners — Robert Hirsch and Melara — listened and sometimes struggled to maintain order. “You’re not in charge — the people are in charge,” one activist, known as Equipto, shouted at Melara after she told a community member to wait until public comment to speak. The crowd then erupted in a chant. “No Tasers!” they repeated. The commissioners — four of whom are appointed by Mayor Ed Lee, who supports Tasers, and three of whom appointed by the Board of Supervisors — will take a vote sometime this fall. Melara threatened to end the meeting if people failed to calm down. Once they did, Scott and the commissioners sat quiet for the most part, listening to community concerns. “We really have to get out of the gizmo mentality and into better training,” said Ethan Davidson, 54, of the Tenderloin, who explained that an electronic device shock could be potentially lethal to him because liver disease and medication have made him physically frail. Others were concerned about the disproportionate use of the weapons on minorities — a fact that Chief Scott has acknowledged in earlier testimony with the commission. One person, Stephen Jaffe — who has launched a campaign to unseat Nancy Pelosi in the 2018 congressional election — said he came with an open mind, but it was quickly changed. Indeed, as the public comment session raged on — more than 30 people spoke for two minutes each — some 30 officers stood around the perimeter of the room. Among them was Commander David Lazar, who was recently promoted to oversee the department’s policy on community policing. Did he believe the community would feel more comfortable with police officers carrying Tasers? Commander Peter Walsh, who oversees the department’s use-of-force policy, was also in the room. He elaborated on Lazar’s point that if the department is permitted to use Tasers, “robust” training and accountability would be top priorities. He cited the case of Bryce Masters, a 17-year-old male who was permanently injured after being tased by a police officer in Kansas City, Missouri. The officer was sentenced to four years in federal prison for violating Masters’ civil rights. One attendee named Harold Miller said he supported Tasers, even though he had himself been tased in the back during a bar fight in Baltimore, Maryland, in 2013. He said the tool saved his life during an incident in which he grabbed a chair to use on police. The Mission District’s own lawmaker, Supervisor Hillary Ronen, remains skeptical of Tasers. 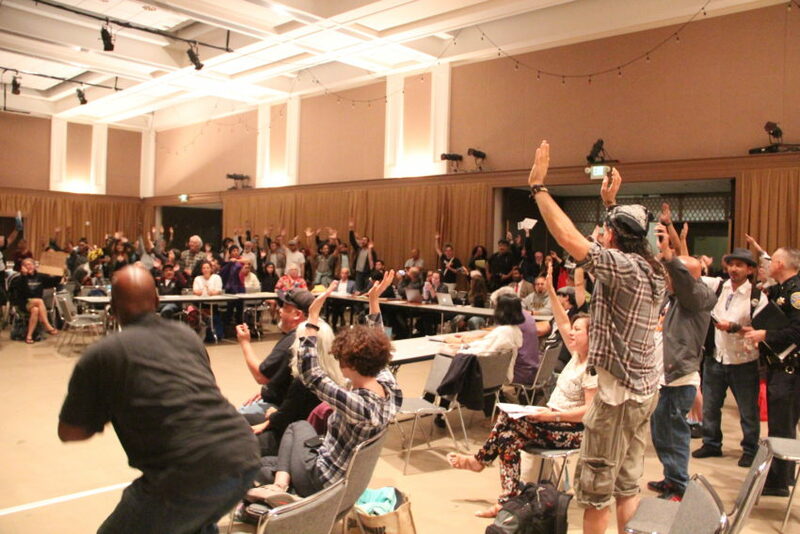 A second public meeting will be held Sept. 19 at San Francisco City College’s Ocean Campus. The Commission will vote on Taser use later this year. So if not the taser, what other non-lethal remedies were suggested? Be part of the solution instead of justing no…. NEXT MEETING TO SPEAK AGAINST TASER WEAPONS IN S.F. -Tuesday, 6:00 p.m. 9/19/201@City College, Phelan Campus Student Union Lower Level “City Café. elected, and he chairs the committee that screens applicants for The San Francisco Police Commission.” Thankfully, Petra DeJesus, a longtime, well-respected member and attorney on the San Francisco Police Commission was voted in to help us fight TASER weapons in our community. NO TASERS FOR SFPD. More San Franciscans will die from TASER WEAPONS or sue the City of San Francisco to get their piece of the billions of dollars we have for our small town. These deaths and destruction will legacy of Mayor Ed Lee and new police chief Bill Scott if we do not stop them. I was present at this event, and it was very clear that almost all of the hundred or so people present do not want the SFPD to acquire tasers. What SFPD needs is more transparency, accountability of officers who use excessive force or behave inappropriately (not paid vacations, referred to by the euphemism “administrative leave”), training in de-escalation tactics, and demilitarization. No use of chemical weapons (e.g. tear gas), more unarmed officers (and an end to the practice of officers attending public meetings armed and in uniform if they are in any way there to present their own viewpoints, as Chief Scott was). The Police Officers Association (POA) is part of the problem. It seems to be a group with a toxic culture which does not reflect community values or serve the public interest. One person at the meeting mentioned their endorsement of Donald Trump. Camarena’s comments, like those of many other members of the public who spoke at the event, were well-informed and on point. The department needs to reorient from a “warrior” culture to a “guardian” culture as she said. Changing police training, and opening it up to public viewing, is key. How police officers are trained should not happen in secret. Officers need in particular to be told, repeatedly and forcefully, that it is their duty to resist and report abuse within the department, and hold their fellow officers accountable for any misconduct. Most cops may not violate people’s rights in the egregious ways we often see on the news and in captured video footage, but too many of them cover for those cops who do, by remaining silent and failing to speak out about it.